Windows Media Player backup is a really important action that helps you to save your time and important data, such as Windows Media Player Media Library. How to back up Windows Media Player files? 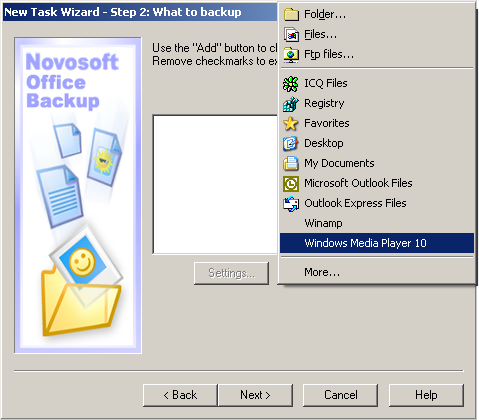 Novosoft Office Backup will let you simply create Windows Media Player backup. You can automatically back up Windows Media Player settings, visualizations, skins and playlists. click the Add button and select Windows Media Player 10.